Thought-provoking literature, perceptions and discussions are important pieces of learning. One way to engage in all this is to read those thought-provoking books and then have discussions about the perceptions of others. Over the last few months that is exactly what UEHS students have been doing during Literature Lunch Circles. 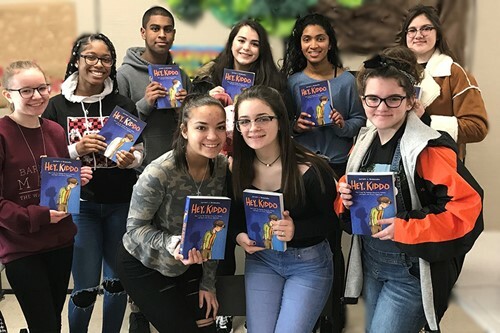 Spear-headed by English teacher Kelli Krieger, students read a young adult novel and then meet during lunch to discuss the book, its characters, what it means to them, and what they take away from it. Books read so far are “The 57 Bus” by Dashka Slater; “Hey, Kiddo” by Jarrett Koczarscka, and “Dear Martin” by Nic Stone. The circle will meet in May to discuss “I’m Not Your Perfect Mexican Daughter” by Erika Sanchez. The circles are completely voluntary and are funded by outside donations from members of the school community. The hope is to continue this next year.